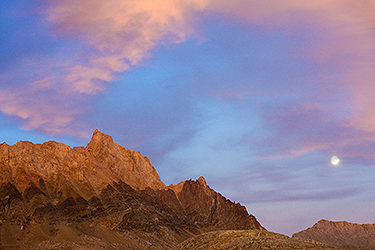 The Sierra Crest and the Owens Valley at Sunrise, viewed from the White Mountains. 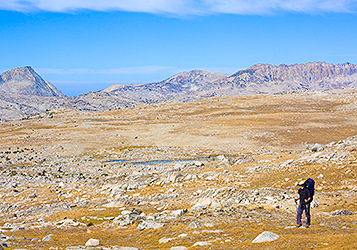 The White Mountains, due east of Bishop California, made a good acclimatization stop before backpacking into the alpine country of the high sierra. 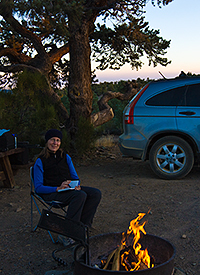 We spent a few days camped at BLM's grandview campground and toured the stark highlands and bristlecone pine forests. 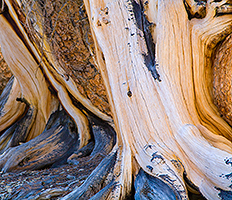 The famed Methuselah Bristlecone Pine Tree in the White Mountains is the oldest known living tree on the planet at nearly 4800 years. The bristlecones don't look so impressive at first glance, but they grow very slowly and the wood is extremely dense -- so dense it rings like a bell! The dead wood weathers to a beautiful golden-orange color and can remain intact for thousands of years in this arid environment. Their range once spread across the great basin, but now they are found only at these isolated high altitude ecological "islands". 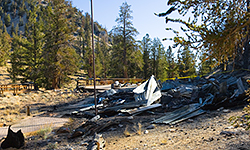 Sadly, just one day before we arrived, the Schulman Grove Visitor Center burned to the ground. All that was left by the time we got there was a pile of charred timber and twisted metal. Several friends had mentioned that this visitor center was world class and a must-see. The cause of the burn is still under investigation, but arson is suspected. There has been a lot of vandalism in the area recently: the nearby White Mountain Research Summit Lab was trashed and numerous vehicles were broken into at trailheads near Big Pine and Bishop. Some believe angry anti-wilderness locals are responsible, in reaction to proposed additions to nearby Table Mountain Wilderness. Whatever the cause, plans are already afoot to rebuild a new center, to be opened in 2010. 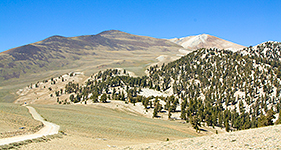 This month is also the 50-year anniversary of the establishment of the Ancient Bristlecone Pine Forest, protecting this important ecosystem! Somehow twenty(!) 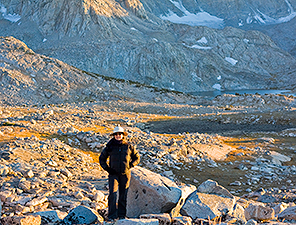 years have slipped by since we last backpacked in the High Sierra. Finally, we have returned to that magical world of granite, alpine meadows, and sparkling lakes. 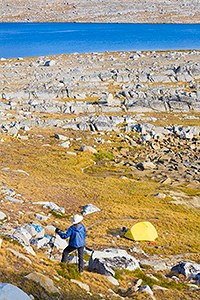 Our six-day backpacking adventure took us over the 11,500' Piute Pass and into the Humphreys Basin -- ringed by many 13,000'+ peaks of the Glacier Divide and the sierra crest, including 13,986' Mount Humphreys. Most of the one hundred or so lakes here are off the main trails, so we were able to find plenty of solitude and room for one of our all-time favorite activities -- cross-country rambling in what one fellow hiker (who was here on his seventh visit) called a granite "playground". 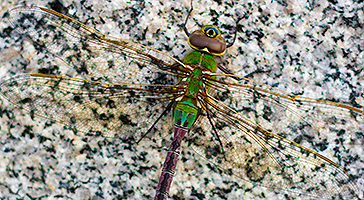 Our resident dragonfly remained perched on his granite wall above our tent all night until the arrival of the morning sun. A full moon rises over Mount Humphreys. A cold sunrise on the Granite Divide. Back to reality...On our way through Yosemite Park over Tioga Pass, we noticed a trail on the map that seemed like it would give a good view of Yosemite Valley. So we did a day hike to the top of North Dome from the Tioga road (9 miles round trip). Wow what a view -- highly recommended! 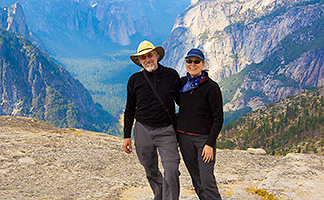 North Dome sits directly across from Half Dome with Tenaya Canyon and the Merced River winding far below. From the top, we casually watched thunderstorms across the valley as they drifted over the nearby peaks. Quite suddenly, one moved into our neighborhood and we were hit by mighty wind gusts that threatened to blow us off our dome. We crouched down, bracing with handholds on the rock, as sand and debris blew over our heads and into our faces and raindrops pelted the ground. Yikes, an exciting ten minutes there!